Photo courtesy of Representation Matters, the best high-resolution, royalty-free stock image collection focusing on inclusion and diversity on the internet. Do you find yourself perpetually struggling to find cute, on-trend clothes in your size that are also affordable? Do you want to be more thoughtful about your purchases and contribute less waste to the Earth? 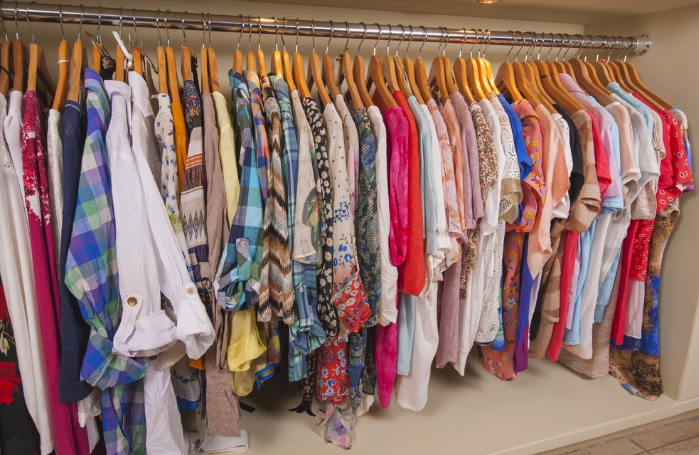 Or are you on the other side of the equation, have embraced the KonMarie Method and want to donate your gently worn clothing to a place where they won’t get lost in a sea of straight-sized clothes? This list is for you! 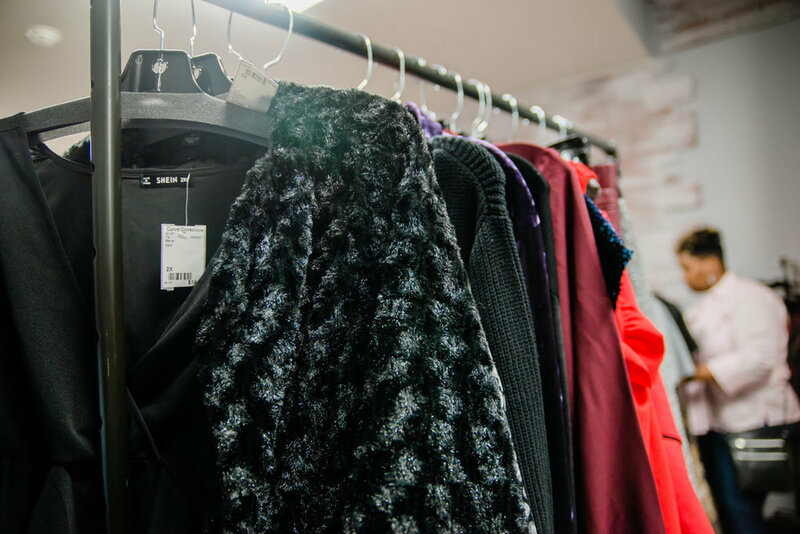 Here at AllGo, we’ve compiled a list of 37 plus size resale and consignment shops located throughout the U.S. or online where you can enter a thrift shop and know you’ll be able to try on more than that one outdated sweater buried in the rack. These stores cater exclusively to plus size customers. For specific size ranges, please visit the websites of each store. If you’re looking to offload your treasured gems, consider these shops to cater to customers similar in your size and make them excited to shop. UPDATE: Due to popular demand, we’ve created a companion piece for this post to share details about plus size consignment events. To learn more or suggest an event to add, visit this page. To find a store near you, please use the search function in the table below to put in the name of the city. If there are results, you’ll see the shops in that city highlighted when you scroll through the table. And if you’ve been to an awesome plus size resale or consignment shop we’ve missed, please add it to the form at the bottom of the page and we’ll keep the list continuously updated. Happy shopping for clothes for all bodies! Athena’s Closet, Inc. is a locally owned plus size women’s consignment shop. The shop was designed and developed as a beautiful, clean, and comfortable shopping environment to fit the needs and/or wants of women sizes 14 and up. Big Deals Plus offers a New Spacious Fun Organized Boutique Atmosphere to Consign and Shop for Plus Size Fashions, Size 14 and Up, For Today’s Savvy Shopper. TO LOOK LIKE A MILLION WITHOUT A SPENDING A FORTUNE!! Cake Plus-Size Resale is a body positive resale shop for sizes XL and up. Cake makes stylish secondhand clothing accessible to those wearing plus-sizes at our brick-and-mortar shop in Minneapolis & in our online shop. At Charisma Consignment Boutique our goal is to be your one stop plus size shop. We provide a first-rate consignment shopping experience for today’s stylish ladies. We want to fulfill all your fashion wants and desires at an affordable price while providing an inviting and fun atmosphere at a superior service. We know what die-hard fashionistas want and we’ve got it all! Our shop carries women size 14W and up. We offer a variety of clothing, handbags, shoes, intimates, jewelry and many other accessories at every price range. What more can a girl ask for?! Our goal is to help you feel pampered and beautiful with quality clothes at a great price. So feel free to look around online or visit us at the store. Go ahead find something unique. Find something special. Find something that screams YOU! CURV EXCHANGE Plus Size Resale is an upscale, fashion-forward and quality resale boutique that sells and trades sizes 14-36+. Our St. Petersburg location opened in Spring 2017 and we now have FOUR locations OPEN in St. Pete, Clearwater, Tampa and Bradenton, Florida. Curv Exchange is Open 7 days a week. We carry plus size clothing, handbags, shoes, accessories & jewelry. Our vision includes offering the curvy woman a boutique shopping experience unique to her needs and her size in a comfortable and welcoming environment. We are more than a plus size resale boutique, we are a MOVEMENT for body acceptance and positivity for curvy women everywhere! At Curve Conscious we offer trendy and stylish apparel, shoes and accessories for women sizes L to 5X. Because every item in our store is hand selected, we're able to offer the best brands and styles in contemporary plus-size fashion at a fraction of the retail price! We believe that every woman has the right to look and feel good about themselves without breaking the bank! That is what inspired us to establish Curvy 'n Chic, a judgment free place to shop where we can embrace our curves, look & feel beautiful, and find quality trendy clothes at great prices! Curvy Girl Kate's is a plus size/curvy girl shop that provides new and up cycled women's clothing for sizes 12 and up at affordable prices in a comfortable shopping environment. It's important for all women to feel valued, proud and happy in their body, no matter what size. Curvy Girl Boutique now offers 3 options for your preloved items NOW, NOT later. WE take in quality merchandise for trade 6 days of every week EXCLUDING holidays and sale weeks. Customer’s in-store credit expires after 6 months. We offer cash option, In-Store Credit & Traditional consignment. To exceed customer expectations in bringing boutique selection and service to the fashion forward woman at pre-loved prices. Fat Fancy’s mission is to create a comfortable, fun, body positive space for our diverse family of plus size customers and artists to sell and buy clothing, accessories, and body positive merchandise. We believe that by connecting them to each other we can create a stronger plus size community. Specializing in Plus Size Perfection. Whatever your style, we are in pursuit of fashion that makes you shine. 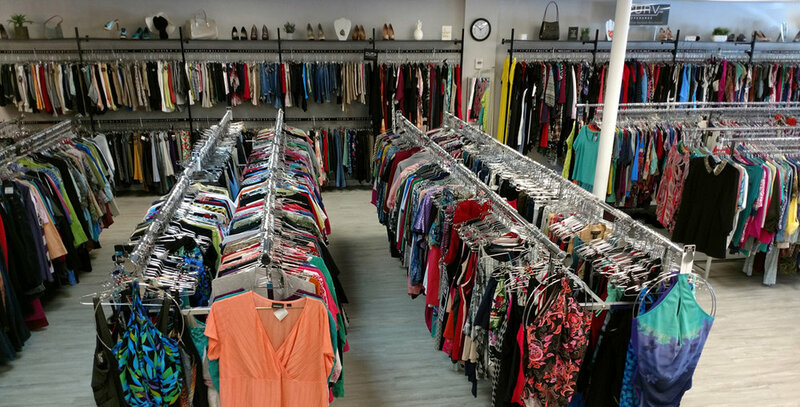 Jamie’s Exclusively Plus is a consignment store specializing in women’s clothing sizes 14 – 6X. The family-owned store was established by Jamie in 2006, and Julie Vargas took over in 2009. Our mission is to provide women starting at sizes 16 XL and up, and women who are taller than most with a trendy and fashionable boutique to call there own and a place where they can style it out. We offer women's size 18(1X), and men's size XXL shirts (44 pants) and up! With brands like Liz Claiborne, Maurice's, Avenue, and Lane Bryant, you'll find something you can feel and look great wearing! Larger Than Life is Dallas’ only consignment boutique exclusively for the CURVY WOMEN (12+). Our upscale consignment boutique features new and barely used women’s clothing & accessories. You’ll find a great selection that spans all of your wardrobe needs – work, special occasions and everyday wear. We also carry robes & nightwear, lingerie, jewelry, bags, belts, scarves, and shoes (sizes 6-14, medium and wide). Our spacious dressing rooms are comfortable and accommodating. Larger Than Life offers world-class service and carries a wide range of labels. Shopping at Larger Than Life is like strolling through a dozen stores within an intimate boutique. Friendly service makes it easy to create complete outfits or find a that special item. At Larger Than Life our stock changes quickly, as we take in new items daily! So stop in often!!! Patti's philosophy is simple; create a warm, inviting place to shop, and a comfortable space to embrace our curves in a judgement free zone and offering quality clothing at great prices. Resale store-We only carry sizes 14 & up. We offer a large selection of new & used clothing & accessories. Open 10-7 Monday-Saturday! We started Ocala’s Curvy Consignment because we wanted women to know that you can look good no matter the shape of your curvy body. We started Ocala’s Curvy Consignment because we wanted women to know that you can look good no matter the shape of your curvy body. Perfect Curve specializes in consignment of better known women’s clothing, size 14 and up. We are the place to come to when you need that little something to finish off an outfit, or when you are interested in trying a new look. Maybe you need help with expanding your wardrobe without draining your pocketbook. We can help. Our knowledgeable staff is here to lend their styling expertise. We carry all styles and brands in plus sizes (14 or XL & up) so we're sure to have something to suit your unique needs. We also have shoes, jewelry, handbags, accessories, and much more. New items arrive every single day! I opened the Phenomenal Woman Consignment Shop in 1998 because I believed that there was a need for an affordable shopping alternative for the plus-sized woman. Many people told me it would never work and that I was ""limiting"" my market. My response to that ""50% of the female population wears size 12 and up, so that doesn't seem very limiting to me"". Plus size doesn’t mean less style – be a part of the #plussize #solutionrevolution! We offer an amazing assortment of designer goods and accessories specifically for plus size shoppers. Our merchandise selection is full of new with tags, unworn or very gently used designer items and accessories. Located in Portland's famous Hawthorne shopping district we provide beautiful clothing for everyone. Featuring plus size high-quality women’s clothing at great prices. Our friendly staff is here to help you find that new outfit you've been wanting. Visit us today! Says Who & Seams to Fit are two stores under one roof where we sell plus size consignment and NEW clothes. We love helping customers feel good in what they wear and want the clothes you find at says & seams to make your life a little easier. Visit our boutique for the latest plus size fashion and accessories. There are always new items to choose from and a wide selection of top brand names. We welcome you to visit us today. We are a consignment store in the Memphis area for all sizes 4 up to 7X. We have a broad exclusive selections for ladies seeking plus sizes up to 7X that are very fashionable and for our smaller sizes we offer a great selection of clothing items. We have been in business since 1993 and have had the pleasure of selling clothing for well over 4900 ladies throughout these many years. MO note: While this one offers straight sizes too, it seems to offer preference to plus sizes. Our grand plan goes like this- let's be a consignment shop that serves the needs (and let's be honest, WANTS!) of the real sized woman! Did you know that over 60% of women in this country are a size 14 or larger, but almost half of brands don't even carry up to a size 16? CRAZY! Here's the deal- we want to cater to YOU! We will carry only items that are a size 14 or Extra Large up on the tag. Our Mission is to create a boutique environment for women to consign and shop for clothing and accessories from some of the most fashionable closets available. A upscale plus size only consignment store with jewelry, shoes and purses for everyone! Plus size consignment shop for all shapes sizes ranging from 12-6x. The Plus Bus meets you on your turf and expand yours plus size clothing horizons right here in Los Angeles. We offer everything from gently-used fashion gems from your favorite brands like Eloquii, Torrid, Premme and more to some of the latest and greatest brand new pieces from plus size's foremost indie designers. Stop by to have the plus size fashion experience you never thought was possible! We first opened our doors on Mother’s Day, 2007. We are a woman-owned, woman-managed, and thoroughly woman-affirmative shop. We also love and respect the men in our lives. We celebrate diversity. We know that our lives are richer when we learn from those who think and believe differently from us. We also know that beauty comes in all shapes, sizes, and colors. We believe that inner beauty creates outer beauty. We expect every person in our shop, beginning with us, to treat others with kindness, patience, dignity and respect. This consignment shop carries clothing for the entire family! From juniors 000 to women's 3X. They also have a large variety of home décor, furniture, antiques, designer items and more! Happy customers, a warm and inviting place to shop, a comfortable space to embrace the beauty of our bodies, and quality clothes at great prices. Everyone is welcome at Two Big Blondes. We always look forward to meeting new customers and welcoming back our regulars. Our staff is trained to help you find the right fit for your body and the right look for a special event or everyday wear. I started Urban Thick to create an online community where plus size women and now big & tall men could purchase quality clothing and accessories without spending ridiculous amounts of money because of their size. At Urban Thick, we sell a wide variety of "quality" clothing and accessories. Our store symbolizes ACCEPTANCE of everyone with a positive ATTITUDE towards men and women's bigger bodies. We define Urban Thick as a plus size woman or man that demonstrates courage and confidence through colorful clothing. Our mission is to INSPIRE and EMPOWER plus size women and big & tall men. We want them to experience the power of feeling awesome in our clothes, while taking advantage of the opportunity our platform offers to sell their unused/unwanted clothes.